On 30 September, Professor Anatoli Mikhailov left his post as rector and became the president of the European Humanities University (EHU) - a Belarusian university in exile. On 30 September, Professor Anatoli Mikhailov left his post as rector and became the president of the European Humanities University (EHU) – a Belarusian university in exile. Rather than resigning from working for the university, Professor Mikhailov switched over to working full-time as the new president of EHU, a position created especially for him. Now the EHU is looking for a replacement for Professor​​ Mikhailov​ who has been running the institution since it was founded in 1992. The next rector will largely determine whether the institution will retain its mission as a Belarus-focused institution or will completely transform and become an regular higher education institution in Lithuania which differs only for targeting Russian-speakers. Some say that it will even determine whether EHU will survive or not. The new rector will also need to repair EHU’s reputation and make it more transparent not in the least because most of its funding comes from EU taxpayers. The institution has recently dismissed several opposition-minded lecturers, closed a number of Belarus-related programmes, faces a downturn in applications and its finances are looking a little hazy. Belarusian Mission Lost in Transition? The new rector will need to work closely with its founding rector Anatoli Mikhailov. He explained the establishment of the new position of President at EHU as a means of supporting the gradual transition of the university's leadership. The 2014 version simply states that EHU "is a non-state Lithuanian institution of higher education". The revised 2011 charter which mentions the word "Belarus" only three times, a notable reduction when compared to the 11 times of its previous incarnation. As a special report of Belarus Digest demonstrated, over the last several years EHU has either closed, suspended or downgraded its Belarus-focused or human rights programmes while simultaneously presenting the institution as important for Belarus and the development of human rights within the country. Although EHU representatives have claimed that more than one-third of EHU courses focus on Belarus, it is difficult to verify this information. On 1 October, Anatoli Mikhailov​, in an interview with Radio Liberty, said that the arrival of David Pollick from North America sped up his own resignation. Some sources interviewed by Belarus Digest who wished to remain anonymous believe that the current management of the university wants him to become the next rector. Pollick's grandparents hail from Belarus, but he does not speak either Belarusian or Russian. He appears to have the support of the Governing Board, but many fear that should he be appointed, the university would drift even further from its original Belarus-centred mission. Since March 2014, Pollick has served as EHU’s provost. Previously he ran several small universities in the United States. According to Forbes, he was among the best paid rectors in the United States in 2010. The New York Times wrote that his current salary at EHU is $150,000 per year. Sources close to the EHU administration suggest that Pollick's total compensation package is double this sum. This kind of answer from the institution is puzzling because EHU lives almost solely on donor funding and it should therefore not be such a secretive post. Not only can the university, that moved to Vilnius in 2004, use its premises free of charge, but it has up until now been almost totally propped up on funds from different Western countries. The EHU already has a significant gap in its budget, which begs the question of whether or not the university can really afford it. In the least, this puts the provost under a considerable amount of pressure to deliver results, in particular to bring in new funding. The salaries paid to senior administrators must be competitive, and the committee recruited from a pool of leaders who have worked at similar institutions in other parts of the world. EHU's faculty salaries are also competitive now for the region from which they are drawn. After Mikhailov's resignation, discussions about alternative candidates began to circulate. A community of EHU students on the VK.com, a Russian-language analogue of Facebook, organised a poll on who should become the next rector of EHU. 160 people took part in the poll. Andrej Laŭruchin, one of the leaders of the opposition-minded EHU Senate​ came first with 15.6% of the votes, followed by Grigory Minenkov, an associate of Anatoli Mikhailov, who received 13.1%. Finally, David Pollick and EHU Vice-Rector for Academic Affairs Aliaksandr Kaŭbaska both received 9.4% of the votes, placing them both in the top 5.
Who should be the next rector of EHU? Conceivable candidates from outside EHU could include Aliaksadr Milinkevich and Aliaksandr Kazulin – former presidential candidates with backgrounds in higher education. Both are known in Europe which could help them raise funds. Belarusians also have a large number of academics who teach at leading Western universities. Several people in Belarus run smaller educational initiatives, like Uladzimir Mackievich from the Flying University or Paviel Daniejka of the IPM Business School. The real selection process will be far less transparent than an online vote. According to EHU's charter the body that will actually select the rector is the General Assembly of the Part-Owners. It includes the Institute for International Education (Lithuania), the Open Society Foundations (United States), and the Eurasia Foundation (United States). Insiders say that the EHU Governing Board, which consists primarily of Western academics, unofficially has a major stake in making a decision on who will be the next rector. To clarify the selection process, Belarus Digest asked the EHU administration several questions: does the General Assembly of the Part-Owners include only these three organisations; what is the Institute for International Education; and how will the assembly take into account the interests of civil society organisations and donors? The EHU Governing Board has set up a Search Committee to be responsible for the open competition for the position of Rector. Very shortly, a description of the post and requisite qualifications will be published internationally and on the university’s website together with details of the process and timetable for the open competition. Interviews will be held in Vilnius in mid-December 2014. The Governing Board hopes to be in a position to recommend selected candidates to the General Assembly of the Part-Owners for a final decision by March 1, 2015.
Who Could Secure the Future of EHU? An ideal candidate should have a good understanding of Belarus, be an experienced manager and someone whom academics, students and the university's supporters would respect. He would need to motivate EHU's staff to be more diligent and responsible in their work. Most urgently, they will need to deal with the serious financial problems facing the university. Even today sources close to the EHU administration say that the EHU's budget gap is almost a million EUR this year – that is around 15% of the current budget. According to its founding rector Anatoli Mikhailov, student fees cover only 14% of EHU's expenses, which speaks to the fact that the university badly needs Western support. It appears to be rather obvious that if EHU continues to move away from its Belarus-focused mission, donors will be less willing to support it. They would rather fund a Belarusian university in exile than simply an ordinary private Lithuanian university. From the time that its exile in Lithuania began, EHU has been an important symbol, concrete evidence that the West can support and sustain an institution which provides a liberal education tailored to Belarusian students – something which is difficult, if not impossible, for them to gain at home. All engaged stakeholders should realise that this symbol may soon disappear if the current issues continue and a major donor pulls out. As a first step, for the university to survive and prosper, it needs to have an open and transparent process for selecting its rector. The decision-makers should seriously take into account not only the views of EHU's private owners but also of its donors, most of whom are funded by EU taxpayers. Finally, the selection process needs to take into consideration the interests of Belarusian civil society, which, at least in the previous version of EHU's charter, was supposed to be the main beneficiary of the Belarusian university in exile. According to a leaked document published by TUT.BY this week, the Belarusian parliament will insert its own special clause when it ratifies the Treaty of the Eurasian Economic Union. The clause will reserve the country’s right to ignore its treaty obligations if Russia does not agree to lift all barriers of the free trade regime that are harmful to Belarus. This most recent scandalous development is unfolding only three months before the planned inception of the next stage of the Eurasian integration project – the Eurasian Economic Union. This is a result of Belarus’s harsh reaction to Russia's plans to reform its taxation system in the oil sector, something more commonly known as a “tax manoeuvre". Belarus will suffer considerable financial losses if this move pushes forward. The presidents of Belarus and Russia will meet in Minsk on 10 October. Given the current geopolitical climate, Vladimir Putin will surely have to make concessions. The Russian Prime Minister Dmitry Medvedev has already promised to cushion the effect of the tax manoeuvre for the Belarusian economy. The House of Representatives, the parliament’s lower chamber, plans to discuss the Treaty of the Eurasian Economic Union (EAEC) on 9 October. Rather uncharacteristically, a leaked document appeared on the TUT.BY portal before the parliament's planned discussion. According to it, MPs will amend the ratification instrument with an important reservation. Belarus wants to sign a bilateral (with Russia) or trilateral (with Russia and Kazakhstan) agreement that will lift “barriers, limitations and exemptions” in trade for certain goods and services. The leaked document specifies those goods and services: energy resources, industrial assembly-line products, automobile shipping and others. Without such binding agreements, Belarus will not guarantee that it will strictly adhere to its Eurasian integration obligations. This is how the Belarusian authorities are reacting to Russia’s previously announced oil tax manoeuvre, a plan to tweak oil taxes by increasing the mineral extraction tax and cutting export duties. The move is part of Moscow’s attempts to improve the competitiveness of Russia’s economy by reforming its tax system. In particular, it wants to stimulate more efficient consumption of energy resources inside Russia and limit the energy rents that it doles out to its Eurasian partners. For example, Belarus gets, according to some estimates, about 16% of its overall GDP from Russian subsidies. The manoeuvre will mean a surge in crude oil prices and losses for oil refineries as well as for the country’s economy at large. In other words, it will significantly impact Belarus’s export potential. According to official statistics, mineral resources made up 33% of Belarusian exports in 2013. Agricultural and industrial exports will also suffer. On 29 September Alexandr Lukashenka met with members of the lower chamber of the Belarusian parliament. He stated that his government would not put up with the Kremlin’s tax manoeuvre. First of all, because we had a different agreement. Secondly, if certain actions are taken in one direction then there should be compensation in another direction. This is a significant amount of money and we should, by no means, suffer to lose out on it. We need to get more than we currently have. […] We have to take steps that do us good. Otherwise, what is the point if we do not benefit from it? He called on the MPs to cautiously defend the interests of Belarus when considering the EAEU Treaty and hinted that the tax manoeuvre issue will impact the country’s decision on whether or not to ratify it. The Eurasian integration project is currently experiencing new tension between its members. Apart from the tax manoeuvre, other issues are also fouling up the integration project. Ever since the Russian government introduced an embargo against certain categories of Western goods there have been growing rumours that Belarus has been re-exporting some of those goods and, subsequently, cashing in on the Russian sanctions. During the Customs Union-Ukraine-EU summit in Minsk on 26 August, Vladimir Putin even made a public accusation to that effect. For its part, Belarus claims that it is suffering financial losses due to the Russian ruble's devaluation. According to the Belarusian Ministry of Agriculture, the country has already seen losses totaling around $160 million. This is not the first time that similar scandals have arisen since the inception of the Eurasian integration project. Perhaps the incident with the most resonance took place in 2012 and had to do with solvent exports. At that time the authorities in Minsk and their partners among Russian businessmen actively exploited a loophole in the Customs Union’s legislation. They disguised oil products as solvents and exported them to the EU. The trick helped Belarus to avoid making any payments export duties on oil products into the Russian state budget as the Customs Union’s laws did not classify solvents as oil products. As a result, Belarus saved about $2 billion in 2012. What is Next for Eurasian Integration? As with the solvents scandal, the current row will likely end with a compromise. On 2 October, during a meeting with Lukashenka, PM Mikhail Myasnikovich stated that his cabinet had suggested a way to resolve the tax manoeuvre issue. Today Belarus has to transfer to Russia’s state budget all export duties on oil products made from Russian crude oil and sold to a third party. In 2013, for example, the government handed over $3.3 billion worth of export duties to Russian state accounts. Belarus has long expressed disagreement with this arrangement and even threatened not to sigh the EAEU Treaty was it not changed. 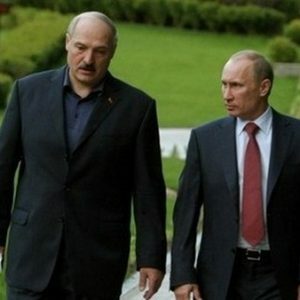 As a result, on 8 May 2014, Alexandr Lukashenka and Vladimir Putin agreed on a compromise formula: in 2015 half of the export duties on oil will go to the Belarusian budget and the other half will go to Russia. Myasnikovich’s solution to the ongoing row foresees the whole sum going to the Belarusian budget. Given Russia's difficult geopolitical position at the moment, the Kremlin is particularly interested in demonstrating progress with its Eurasian project. Therefore, it does not want to see any visible prolonged tension with Minsk and will be forced to offer some kind of compensation to its Belarusian partner. On 7 October, the Russian PM Dmitri Medvedev met with his Belarusian counterpart and promised to cushion the negative effects of the tax manoeuvre. Precise details of what this entails remain unknown. Belarus will hardly get everything it wants but the concessions will likely be lucrative enough for Minsk to ratify the EAEU Treaty and host a peaceful summit of the Supreme Eurasian Economic Council on 10 October. This will not, however, put an end to similar tensions in the future. Yauheni Preiherman is Policy Director of the Discussion and Analytical Society Liberal Club in Minsk.